Perfectly fudgy, chocolatey and best of all, easy. 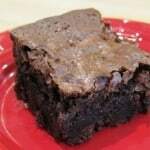 This gluten-free brownie recipe gets its incredible flavor from high quality cocoa, and you can make it dairy-free too! KC the G-Free Foodie shows you how to make the best gluten-free brownie recipe! Simple, fudgy and delicious, you’ll use this recipe again and again. You can make them dairy free too – just use DF chocolate chips. These brownies feature a gooey center and crispy edge with a deep-dark chocolate flavor that everyone will love. Make sure you use good quality cocoa powder – that’s important for the chocolatey flavor! In a small bowl combine flour, xanthan gum, salt, baking powder, and cocoa. Mix and set aside. In a large bowl, whisk oil and eggs together until combined. Add vanilla and sugar. Slowly mix in flour mixture and water. Once all flour is combined, spread evenly into pan. Bake on center rack for 30-35 minutes or until toothpick comes out with just a few crumbs. TIP : For more chocolaty flavor add ½ cup chocolate chips. This entry was posted in Baked Goods, Desserts, Recipes, Recipes & Techniques by Cooks We Love, Super Bowl Snacks! and tagged autism gluten free, celiac disease, G-Free Foodie, gluten free, gluten free baking, gluten free cooking, gluten free parent, gluten free snacks, kc cornwell. Bookmark the permalink.